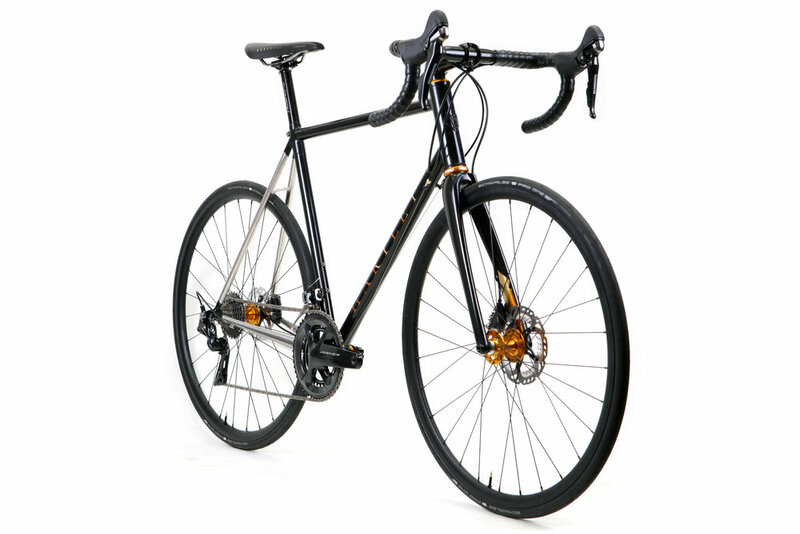 This road bike is designed to keep Michael on top form whether on long Sunday rides or fast sprints out of the city and back. For the tubing we went for Columbus Spirit and Life for lightweight zingy feel match with an XCR rear in a raw brushed finish. The forks are ENVE’s new carbon Road Disc, which can accommodate up to a 32c tyre, yet still look slim and elegant and the 12mm thru axle provides sharp and confident handling. 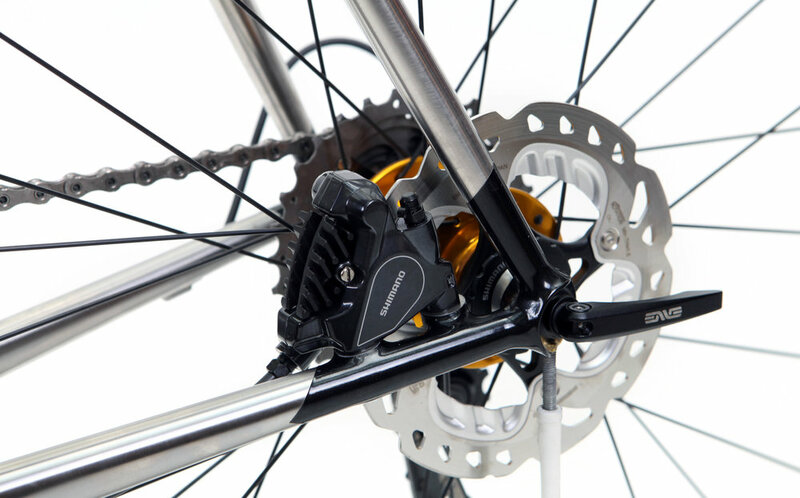 We chose the new Dura Ace groupset with direct mount rear derailleur for its superb shifting and braking, matched with its stylish all black make over. Rolling on a great Chris Kingand Pacenti handbuilt wheelset, ready to ride mile after mile of fresh black tarmac or explore the quieter lanes. 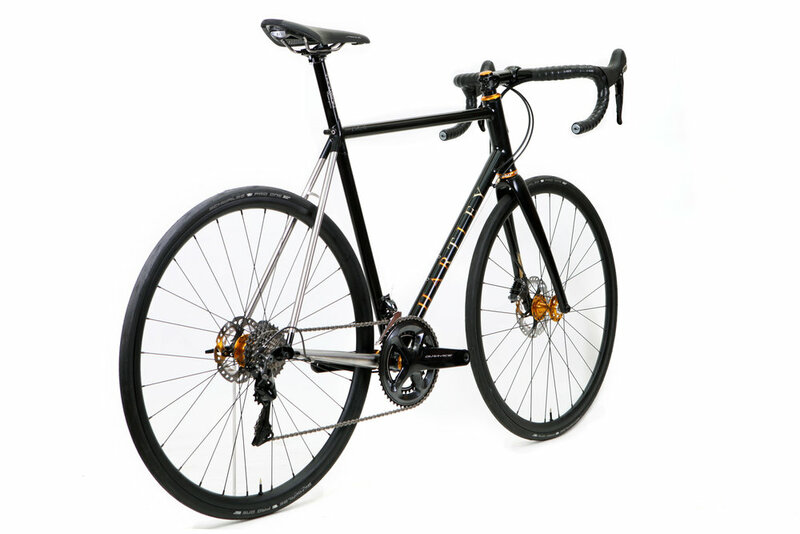 Its black ultra stealth paint job was conceived as an homage to a black and gold Raleigh Michael had in his youth. 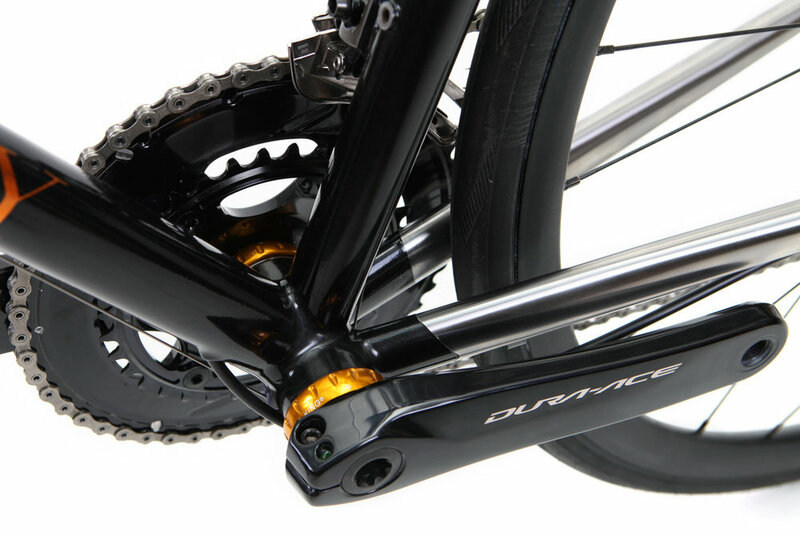 The multi coloured gold leaf details were carefully matched to the Chris King components and they glow against the metallic black on the downtube and inside of the fork. In a bit of a departure from what we normally do and to keep with the stealthy theme the silver details and headbadge have been kept under paint, hidden unless you’re close enough to spot them! 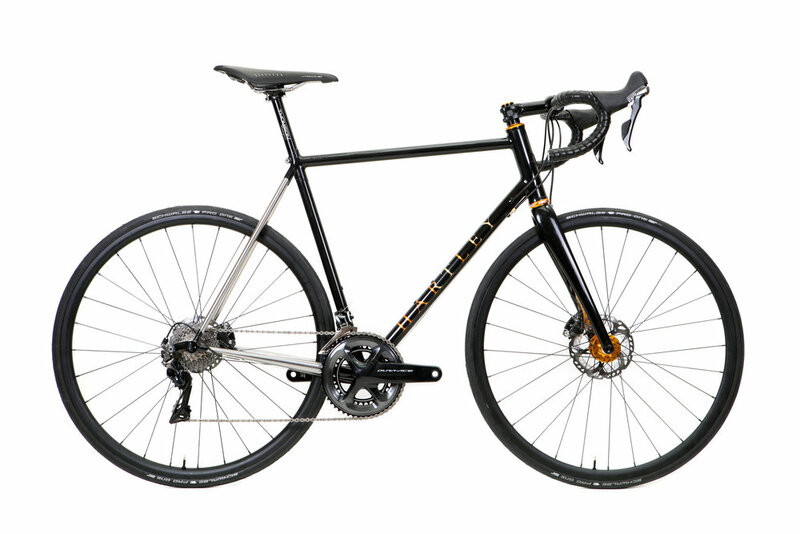 Tubing: - Columbus Spirit/Life front triangle and brushed XCR rear triangle, 44mm headtube. Wheelset: - Pacenti Forza Disc rims laced to Chris King R45 hubs, ENVE skewers. Finishing Kit: - Thomson Elite stem, Masterpiece seat post and Deda Zero100 bars, lizard skin bar tape. 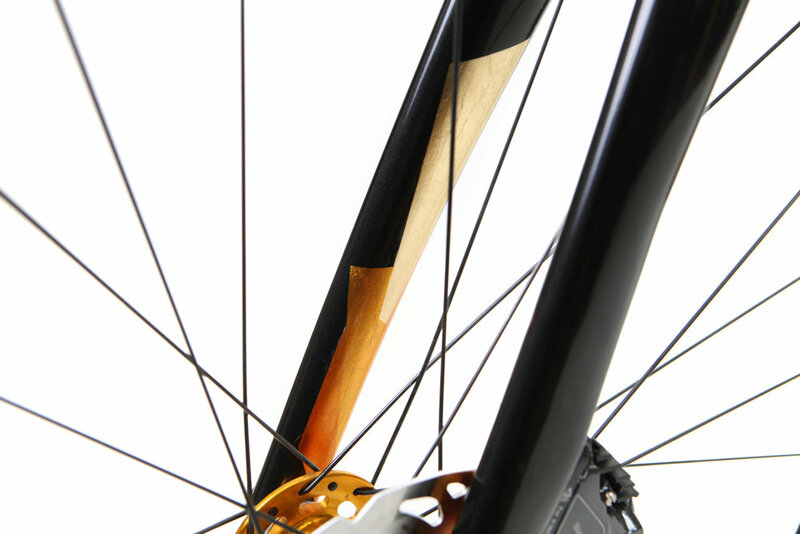 Paint: - Hand Spray paint by Hartley Cycles - Black with Copper and Gold Leaf. 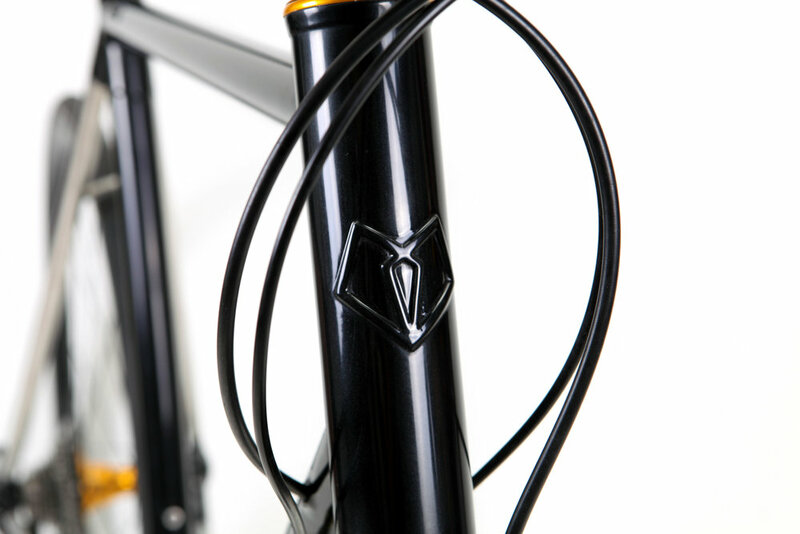 Details: - Stealth black headbadge and hand cut name on top tube. Custom seat stay bridge.